Engel, Z., Láska, K., Nývlt, D. and Stachon, Z. 2018. Surface mass balance of small glaciers on James Ross Island, north-eastern Antarctic Peninsula, during 2009-2015. Journal of Glaciology 64: 349-361. The latest team to do so was that of Engel et al. (2018). Recognizing that there is a dearth of glaciological data in the Antarctic and sub-Antarctic regions despite the large extent of glaciers that inhabit these domains, the four Czech scientists analyzed surface mass-balance records from two glaciers on James Ross Island, located off the north-eastern edge of the Antarctic Peninsula. The first glacier, Whisky Glacier, is a land-terminating valley glacier, while the second, Davies Dome, is an ice dome. According to the authors, "because of their small volume, these glaciers are expected to have a relatively fast dynamic response to climatic oscillations and their mass balance is also considered to be a sensitive climate indicator," citing the work of Allen et al. (2008). So what did the mass balance records of these two glaciers reveal? 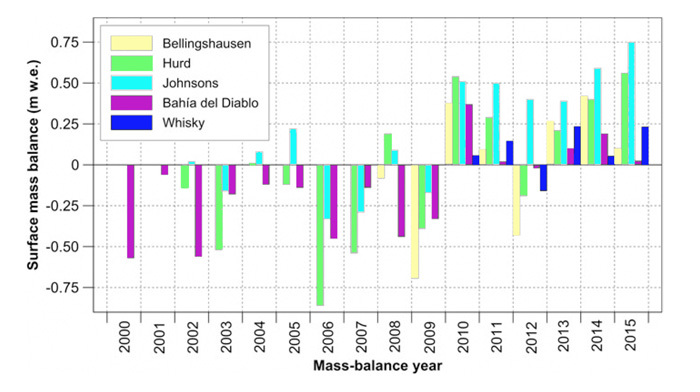 Over the period of study (2009-2015), Davis Dome and Whisky Glacier both experienced cumulative mass gains of 0.11 ± 0.37 and 0.57 ± 0.67 meters of water equivalent, respectively; and their annual surface mass balances were positive in every year except 2011/2012! Placing the above findings in context, Engel et al. write that they "indicate a change from surface mass loss that prevailed in the region during the first decade of the 21st century to predominantly positive surface mass balance after 2009/2010." Additionally, they note that the positive mass balances observed on Davis Dome and Whisky Glacier "coincide with the surface mass-balance records from Bahía del Diablo Glacier on nearby Vega Island, Bellingshausen Ice Dome on King George Island and Hurd and Johnsons glaciers on Livingston Island" (see Figure 1), all of which records reveal "a regional change from a predominantly negative surface mass balance in the first decade of the 21st century to a positive balance over the 2009-2015 period." Furthermore, the researchers add that "the change in the glacier mass balance follows a significant decrease in the warming rates reported from the northern Antarctic Peninsula since the end of the 20th century," and "is also consistent with the regional trend of climate cooling on the eastern side of the Antarctic Peninsula." Allen, R.J., Siegert, M.J. and Payne, T. 2008. Reconstructing glacier-based climates of LGM Europe and Russia - Part 1: numerical modelling and validation methods. Climates of the Past 4: 235-248.